Fri., May 27, 6-8 pm. Performance at 7 pm. 4th Friday, May 27, 2011, 6 to 8 pm. Bounce house and family interactive performances. Thwack! Kablam! Conserve! 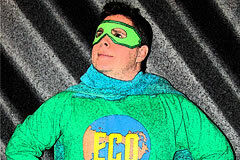 The Atlantic Coast Theatre For Youth performs The Adventures of Eco-Man, a superhero comedy about the importance of â€œgoing green.â€ Mild mannered reporter, Eric Eckerman, transforms into the superhero, Eco-Man! Eco-Man will need the help of the audience to defeat several menacing foes. This show is a great blend of science, super powers, and tons of fun!